Mascara is my one make up item I couldn't live without and I never leave the house without wearing it! I have a current love - hate relationship with mascara - you see, back when I was an online marketing manager in Central London, I always wore a Chanel mascara, but then when I became a play at home mum and even more recently since buying our family home, pennies are a bit tighter, Chanel mascara is no longer an option so now I'm in this whole love - hate thing of trying to find one that stands up to my high expectations for less than half the price! I did love an Urban Decay one but because there isn't a local stockist, with having to add on postage costs, it seemed a bit pointless really and I'm too impatient to wait as I have a habit of not realising my mascara has run out with enough time to allow 7- 10 days postage. 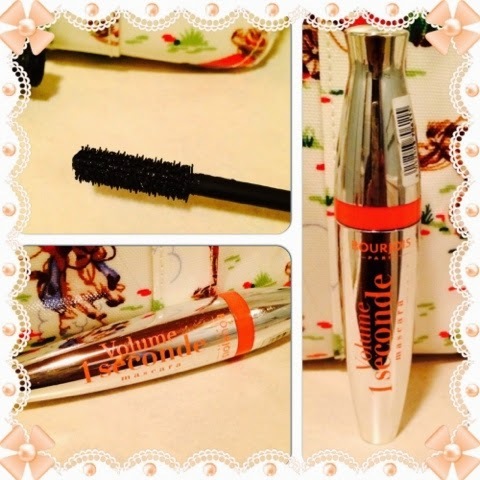 When I was asked if I'd like to review Bourjois Volume 1 seconde Mascara, I said "yes please!" - I've spent a small fortune on the easily available brands in Boots and I'm never happy with them, they usually either have a useless rubber stick to apply it with, start flaking off after four hours (problematic for my contact lenses!) or they are brilliant for a week and then dry out already! But I'm please to say "I'm happy!" I absolutely have enjoyed Bourjois Volume 1 Seconde Mascara - it doesn't need a billion coats, it looks great after literally 1 second! It doesn't start shedding small black bits onto my cheeks and contact lenses and it still looks fresh by the end of the day and I've had my pot open for 3 weeks and it hasn't dried out! I think I've finally found my Chanel replacement - it's on an intro offer at Boots at £7.99 and it's usually £9.99. This mascara volumises and coats well, it dries very quickly so if you want to apply more than one coat, do it fast! I didn't find any clumps, smudges or flakes from this lovely deep pigment black mascara and I will actually buy it again. * I received one Bourjois' Volume 1 Seconde mascara for the sole purpose of being able to carry out this review. All words and thoughts are my own.